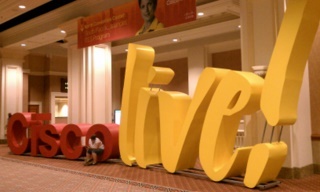 This post is an annual collection of advice on how to get the most out of attending the Cisco Live conference (old hands may still call it Networkers). Some of it is applicable to any training event, but most of it is more specific. Plan to get to the conference city no later than mid-afternoon the day before the conference starts. That way even if you have a delayed flight, you should get there before too late in the evening. Even if you can’t check in until 3PM you can always drop your luggage off at the hotel and wander around. The idea is to make sure you get there early enough to get a decent night’s sleep. Don’t forget to pack a good pair of walking shoes because you’re going to be doing a lot of walking. This convention center is huge! Orange County Convention Center North/South Building – Very pretty, but not the building Cisco Live 2013 will be in, unfortunately. We will be in the West Building. Personally, I plan to stay at Spring Hill Suites. It’s a pleasant 10 minute walk from the Orange County Convention Center, where this year’s conference is being held. In case of afternoon thundershowers (which are almost a daily occurrence), or if you are just plain tired, the conference is running a bus. This gives you options. I think it’s the closest hotel, anyway, and it’s one of the least expensive. 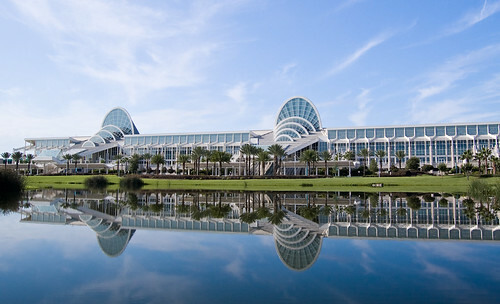 I’ve been there several times for conferences held at the OCCC, and have been happy with it. Cisco Live is the only conference I’ve been to where you need to sign up for your breakout sessions before you go. You may have attended other conferences where you can wander in & out of sessions if one turns out to be uninteresting or you have a sudden change of heart about which you want to attend. Cisco Live is different. The purpose of signing up before hand is not just to be a helpful schedule, but you need to sign up beforehand because it’s your reserved seat for the session. This is primarily important for the most popular sessions, but you don’t want to be stuck waiting outside of a session you really want! Here’s how it works: at the doors for every session will be attendants with a computer and a scanner. 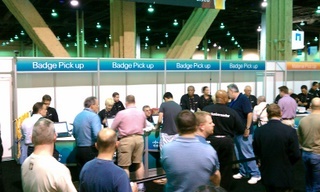 They’ll scan your badge as you enter and you’ll see a green or red light on the screen. If you are registered for the session, you’ll get the green light and you’re good to go. If you aren’t registered or are on the waiting list, you have to wait. If it’s not full, you will get the opportunity to enter. I’m not sure how long they wait before letting you in, as I’ve not yet had to wait, but I’ve seen others waiting. NetVets are conference attendees that have been to 3 of the last 5 Networkers. NetVets are given the opportunity to sign up for their sessions a week before everyone else. This is done because many sessions repeat from year to year and you may not have been able to get into a popular session in the past. This gives repeat attenders an opportunity to sign up for sessions they haven’t been able to get into. NetVets also get some extra benefits; even more if they are a CCIE or CCDE. When the session catalog opens up on the registration website, I suggest you get in as soon as possible to schedule the sessions you care about most. You can always go back later to change sessions. When I first went to Cisco Live, I wanted to sign up for all kinds of interesting sessions. After a while I realized that despite there being 4 days of sessions, you can only squeeze so much into your schedule and had to prioritize the topics that were most important. I also recommend you leave some room in your schedule for the World of Solutions Expo, but more on that later. Don’t forget to sign up for your free certification exam, and don’t forget to schedule your sessions around it. Personally, I recommend doing it first thing in the morning so you are fresh. Eat some fruit for breakfast that morning. Save the carbs for later. Also, don’t forget about Cisco Live 365. This site has all the PDFs and many recordings of sessions from the last several years of Cisco Live, including international Cisco Live conferences. Some of the sessions recommend you have attended another session as a prerequisite. You can view some of these virtually (or at least browse the PDF) before the conference. Sometimes, you can look through the PDFs of sessions you are thinking of attending to decide if you actually want to. This is an excellent resource. Even if you don’t go to the conference, you should be using it. I’ve written about it before here. Whenever possible, try to get to your sessions early. Getting there late only to find there is nowhere to sit is a bummer. Don’t be afraid to sit in the front, especially if you are late. There are often open seats in the front and in the middle of rows while the back and all the edges are packed. Be prepared for a good speaker to make light of you and the others that are arriving late, at least during the first few minutes. They may even invite you to sit in front. Go with a smile. There’s always late people, especially in the morning sessions, you won’t be the only one. Why are you or your employer paying for you to attend the conference? Obviously, it’s so you can spend all day “networking” on Twitter/Facebook/IRC (some people still use it, really! Check out #packetpushers on Freenode.) OK, maybe it’s not. That’s not to say that the proverbial hallway track and social media aren’t valuable. They definitely are. In fact, I recommend following the hashtag #clus on twitter. However, while you are in the midst of the Nexus Multicast Design Best Practices session is probably not the ideal time to be watching your Twitter feed. Otherwise, you’ll hear something you really care about, come out of the distraction, and realize you’ve missed it. At least, that’s the way it goes with me, so that’s the suggestion I make. Another thing to avoid is the temptation to look up that new feature you just learned about, or even remote into your favorite networking device to see if it supports the new bell and/or whistle. Save it for later! Also, it’s easier to stay on task if you are comfortable. If heavily air conditioned spaces feel cold to you, you may want to bring a light jacket. I’m from the Seattle area, so these spaces are perfectly comfortable to me, but I know plenty of people who think the sessions are a little chilly. products, talking to vendors, and picking the brains of Cisco TAC engineers. I have found all kinds of useful vendors at the WoS that I previously had no idea existed. You can ask Cisco people, both technical and non-technical, those tough questions you have saved up. There’s a special section of the show just for asking TAC people that question that’s been bugging you, or that you thought of because of a session you attended. Most of us are heavy users of mobile devices. While you are attending Cisco Live you will probably spend a lot of time using your smartphone, tablet, and/or laptop. Most sessions will have a place for you to plug in to power or charge your devices. If you want to use these plugs, remember “to be early is to be on time…” The days are very long. I typically will start out by heading to breakfast around 7:30 and will get back to the hotel after dinner and conversation. Probably about 21:00 every night. More like 23:00-0:00 on the night of the CAE (see below). This is a long day for your devices, let alone you. Having some sort of portable charger (such as the New Trent products mentioned in the comments) for your phone is really nice, especially if you are using it for social networking and pictures. The Customer Appreciation Event, but referred to as the CAE (pronounced “see ay ee”, not “kay”). This is a giant social gathering for all the attendees. A large venue is filled with food and music. 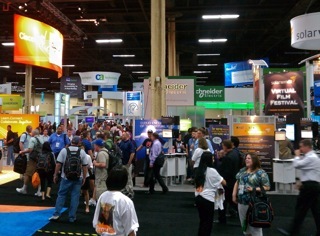 It’s a great time to relax and just socialize with people you’ve met at Cisco Live. This year we will be at Universal Studios Flordia and besides the rides, we will have Journey and Pretty Lights to entertain us. You can buy a pass for your spouse or SO to accompany you. Sorry, no kids; CAE attendees must be 21. I don’t think you’ll need that light jacket for this. It should be plenty warm, and if it rains they will hand out nifty transparent ponchos with a universal logo on them. So that’s my advice for getting the most out of Cisco Live. It’s a great place to learn, network, and get questions answered. You’ll meet people from all types of environments, some will even be similar to yours. You can find out how they do things in their shop or how they solved the same problems you’ve been trying to solve. Sometimes you’ll just share war stories, which can be therapeutic, too. I find the sessions useful, but the conversations and people you meet can be just as useful, if not more, than the sessions you attend. Maybe a mention of CAE? I like to have a light jacket handy, sessions can vary in temperature. I’d also suggest bringing a small battery pack like a New Trent. Not mentioning the CAE may seem like a glaring oversight, but tells you the importance I attach to it. :) Those are all good ideas. I’ll add them! Nice write-up, Scott. See you there!